Smithers Part of the BC Adventure Network. Over a million web site visitors annually ! 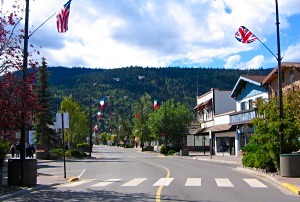 Smithers is located in the heart of the Bulkley Valley. The community is surrounded by mountains which provide the backdrop for the downtown's Alpine setting. 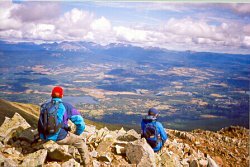 Smithers also provides mountain lakes, rivers and waterfalls for the adventurous to experience and explore. The spring and summer months lure the outdoor adventurer to the surrounding mountains to see nearby glaciers, hike or horseback ride in the alpine meadows. 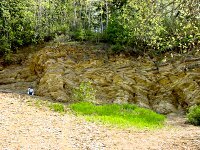 The fossil formations at Driftwood Canyon Provincial Park are a haven for the rock hound. Area lodges cater to those who are keen for fishing, wildlife watching, canoeing or even photo safaris.Fall lures the hunters and fishers, while the majestic changing colours are a magnet for the avid photographer. Cross-country and down hill skiing plus snowmobiling are there for those who enjoy winter activities. 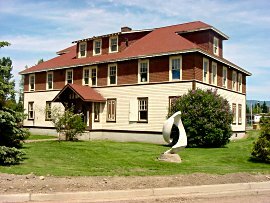 Smithers also boasts a colourful history; once the divisional headquarters of the Grand Trunk Pacific Railway, the era can be relived at the Bulkley Valley Museum. The local wildlife museum and fish hatchery encourages a closer look at the regions natural inhabitants. No matter what the season, Smithers offers a smorgasbord of activities guaranteed to whet the appetite of the explorer, thrill seeker or romantic. 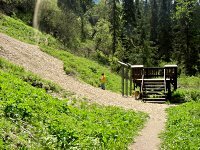 Accommodations: There are two nearby provincial park campsites as well as municipal and private campsites. There are a number of hotels/motels in town with lodges and resorts in the surrounding area. Access: Smithers is serviced by commercial air and bus service as well as being on the VIA Rail Line. Highway 16, a well maintained, major highway; can take you west to Prince Rupert or east to Prince George. Recreation Facilities & Activities: golf courses, swimming pool; curling & skating rinks; fitness trail; picnic sites; mountain biking; hiking; canoeing; kayaking; rock climbing; rock hounding; cross country & downhill skiing; horseback riding; river rafting; hunting; snowmobiling; waterskiing. December- Old Timer's Hockey Tournament, Smithers Curling Cash Spiel.